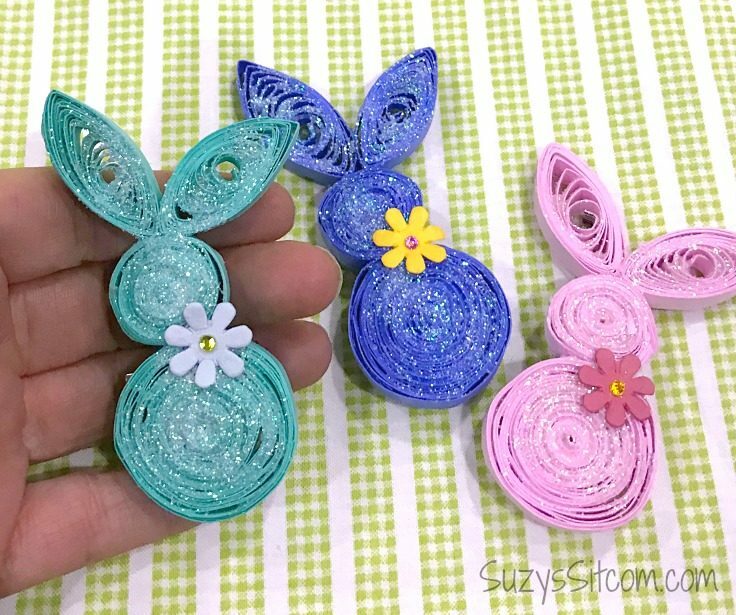 Create a cute Bunny Brooch using the simple craft of paper quilling! This fun Easter Craft is sure to be a hit! I’m always looking for an excuse to create. Let’s face it. Most crafters live for holidays. Each holiday provides a new theme to work around, and Easter is no exception. 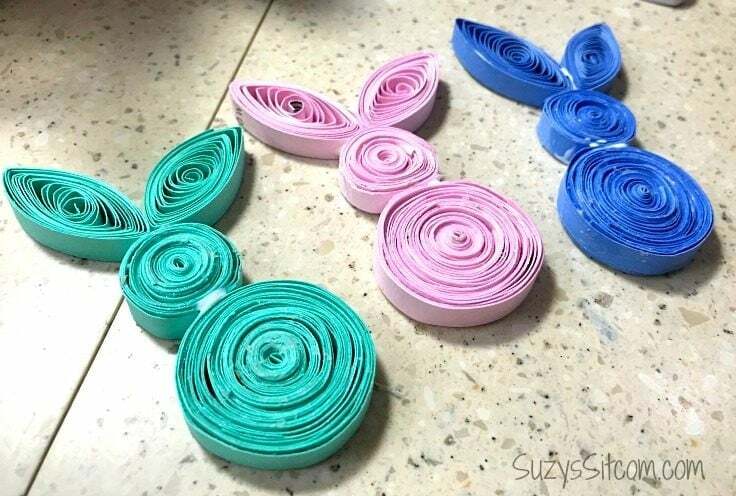 This is Suzy from Suzy’s Sitcom, and I would love to share with you my latest fun Easter craft: Bunny Brooches made with paper! If you are a regular reader of the Sitcom, then I’m sure you are familiar with my obsession with quilling. I enjoy the challenge of creating beautiful things with little more than colored cardstock, or upcycled materials. These sweet fun Easter Bunny Brooches are not only easy to make, but will add a little festivity to your outfit! Each bunny uses only one sheet of colored cardstock paper, and the project is easy enough that the kids can help! 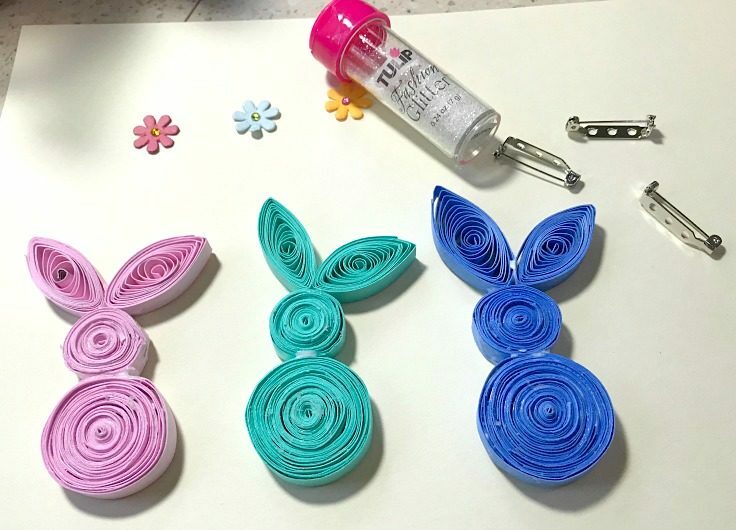 This is a fun Easter craft that you can do with your kids or even during a craft night with your friends. 1. 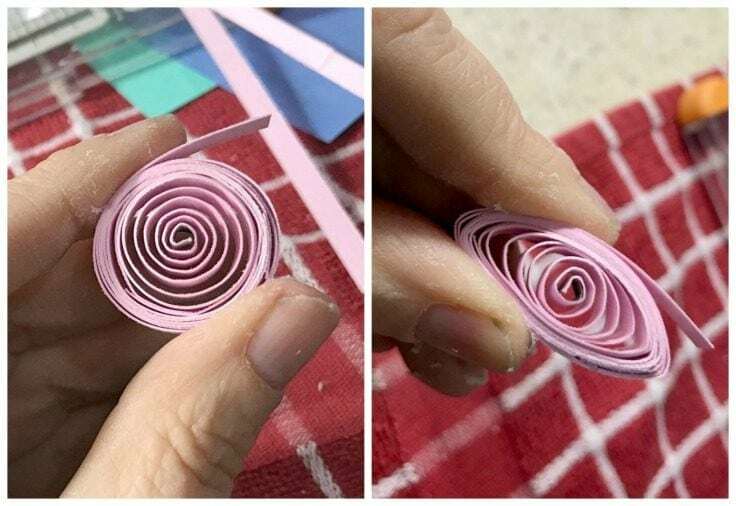 Cut the Paper into Strips. To begin making the Bunny Brooch, use your paper cutter or a pair of scissors to cut your sheet of colored cardstock into 1/4″ strips. 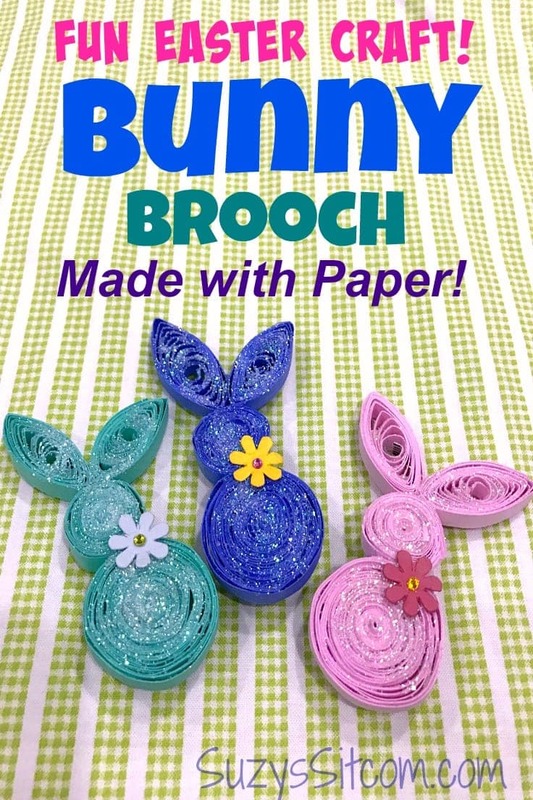 You will need roughly one sheet of cardstock paper for each bunny brooch. For this project I use a small quilling tool. You can find them at most craft stores. I paid just a few dollars for this tool and I’ve used it for years! Also, I prefer to use Tacky Glue because just like it says in the name, it is tacky. I can work much more quickly as the glue works fast and dries clear. 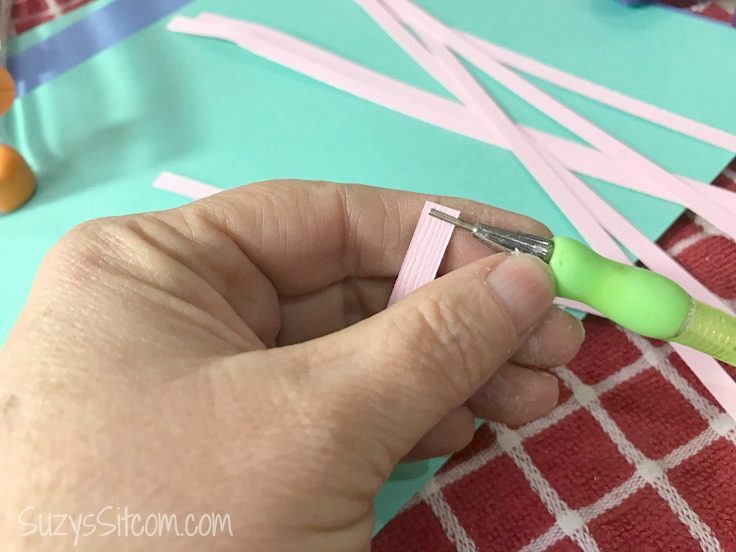 Slide the end of a pink strip into the slot of the quilling tool. Then twist the tool and begin winding the paper strip around the end of the tool. Twist the tool and wind the paper until the entire strip is wound around the end of the tool. 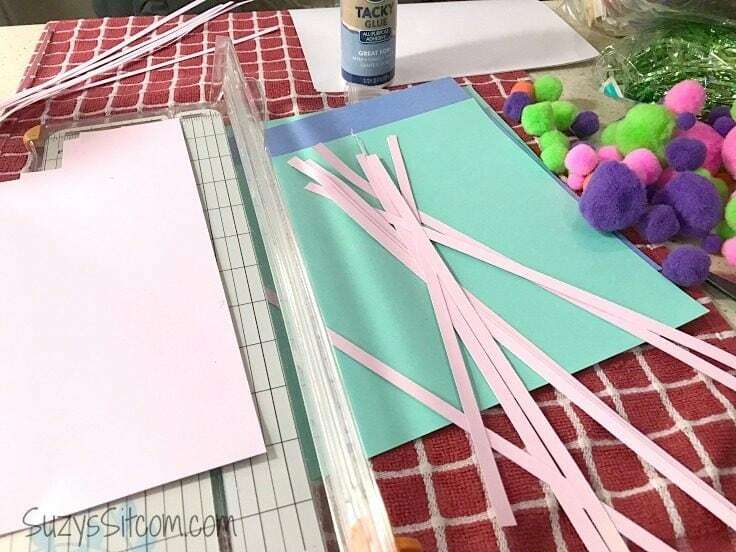 Add dots of tacky glue along your strips of paper and continue to wind them into a large circle, adding strips as you go. 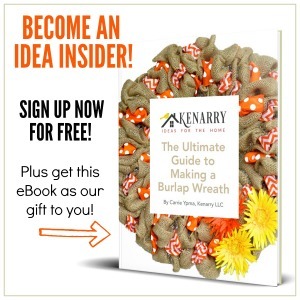 Once the circle has begun, you can remove the quilling tool and continue by hand. Using the technique above, create a large circle for the body of the Bunny Brooch, approximately 1-1/4 inch in diameter, and a smaller circle for the head, approximately 3/4 inch in diameter. Glue the head and body of the paper bunny brooch together using tacky glue. Each ear will require 3 strips of 1/4 inch wide paper cut along the length of the cardstock. Use the tacky glue to glue the three strips together to create one long strip for each ear. 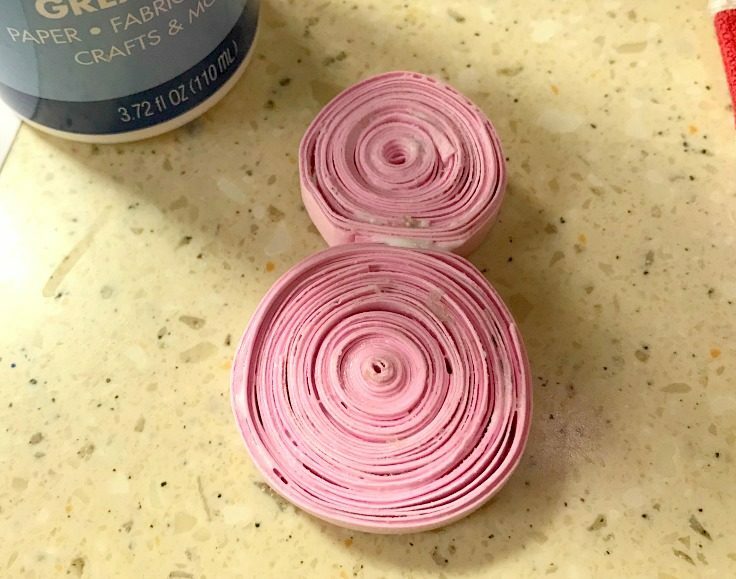 Once the glue has dried, use the quilling tool to wind the strip into a circle. (Do not add dots of glue to this one)! Remove the tool and allow the circle to loosen a bit, then pinch each end to create a petal shape. Use a dot of glue on the end of the strip in order to maintain the shape. Repeat for the second ear. Glue the ears to the top of the each head. Allow the glue to dry for about one hour. To add a bit of sparkle and a few finishing touches, begin by painting the top of the Bunny Brooch with a light coat of Mod Podge. While the Mod Podge is still wet, sprinkle the Bunny Brooch with clear glitter. Glue on a small scrapbook flower. Once the Bunny Brooches are dry, glue a pin to the back with E6000 glue. These Easter Bunny Brooches are sure to make you smile! Create a whole batch to add to your Easter baskets. They make a great final touch to your festive outfit. Want them as a year round decoration? Consider adding a magnet to the back instead of the pin! More Paper Crafts from Suzy’s Sitcom! 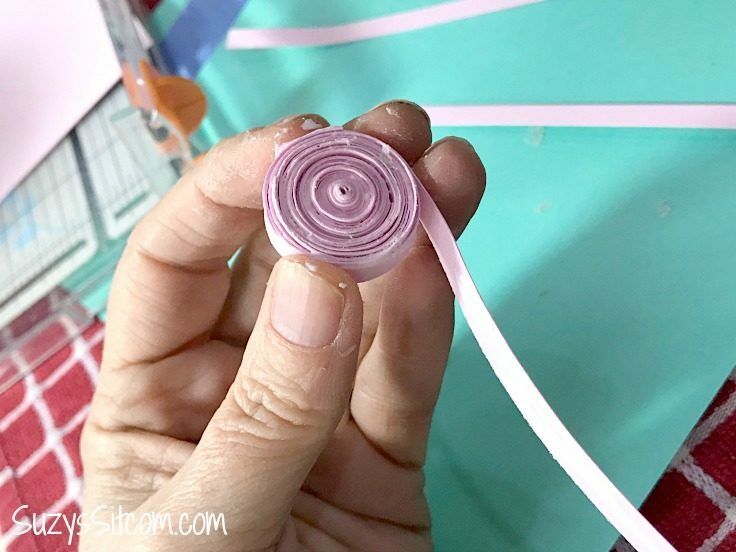 If you enjoyed this fun Easter craft, you will love these spring crafts too. Check them out! 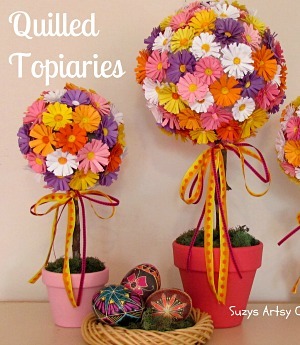 How to make Beautiful Paper Quilled Topiaries! 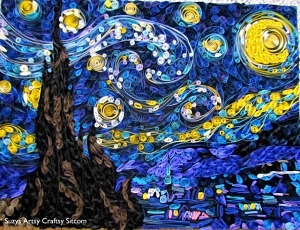 Starry Night made with Paper! 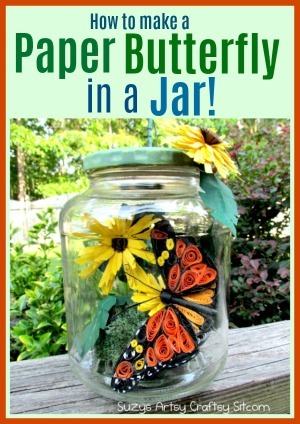 How to Make a Paper Butterfly in a Jar! Suzy has a background in fine art, graphic design and photography. She created Suzy’s Sitcom in 2010 as a way to document new and original art and craft ideas. 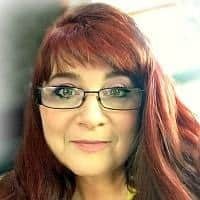 Her website features arts, crafts and humor, with a specialty in vintage and recycled crafts, quilting and sewing. Suzy, her husband and two dogs are full time travelers, living in their RV as they experience the country one campsite at a time. Many of her projects are influenced by the area that they are currently exploring and the people that they meet. Follow Suzy on Facebook, Pinterest, Instagram and Twitter.